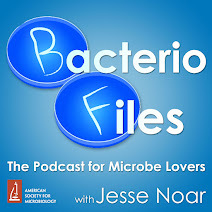 This episode: Light increases the growth even of some bacteria that don't harvest its energy! Light from the sun is one of the fundamental sources of energy for life on this planet. Plants and other phototrophs—photosynthetic organisms that get their energy mainly from light—form the foundation of the food web, and organisms that feed on them or that feed on organisms that feed on them are all dependent on the ability to capture the sun's rays. There are other ways to benefit directly from the sun's energy, besides photosynthesis—some microbes have enzymes that use light energy to repair damage to DNA (the same damage that is caused by ultraviolet light), and we use sunlight to synthesize vitamin D.
In this study, however, microbes are discovered to grow faster in the presence of light despite not being phototrophs or producing any light-harvesting proteins. The scientists discover some possible light-sensing proteins, though, that could regulate these microbes' behavior, allowing them to synchronize their growth cycles to phototroph partners in aquatic environments. Maresca JA, Keffer JL, Hempel P, Polson SW, Shevchenko O, Bhavsar J, Powell D, Miller KJ, Singh A, Hahn MW. Light modulates the physiology of non-phototrophic Actinobacteria. J Bacteriol JB.00740-18.